City Administrator Shawn Kessel leads a bus full of lawmakers on a tour of Dickinson. The decade-long shale fracking boom in North Dakota sent the population of oil patch communities soaring. These towns beefed up their public services to accommodate all the newcomers, but this sent their finances plummeting at a time when the price of oil tanked. Now many oil patch cities are tens or even hundreds of millions of dollars in debt. They’re looking for stable funding to pay back their loans while hoping all the new residents choose to stay. The graph to the right shows the population gain in several bigger oil patch communities known as “hub cities” (more on that later). During the boom, tens of thousands of people flocked to western North Dakota’s Bakken oil fields for work. Take Dickinson. It was a sleepy town of 16,500 people a decade ago. But its population climbed to peak at 23,800 in 2015, according to U.S. Census estimates. All this growth, and the accompanying infrastructure to serve the booming population, are giving these small communities an unusual spate of great PR. Livibility.com labeled Dickinson the best small town in the United States in 2013. Most recently, TIME’s Money Magazine called it the sixth best place to live in America. “It’s like well, we all kind of knew it,” Mayor Scott Decker says with a smile during a recent interview. He was born and raised here. But it’s not just him or the rankings praising the town. It’s the newcomers, too. “We get a lot of comments about, ‘Wow, what a great community. Wow, this place is so clean,’” Decker says. Take a drive through town and it’s obvious this place has grown. 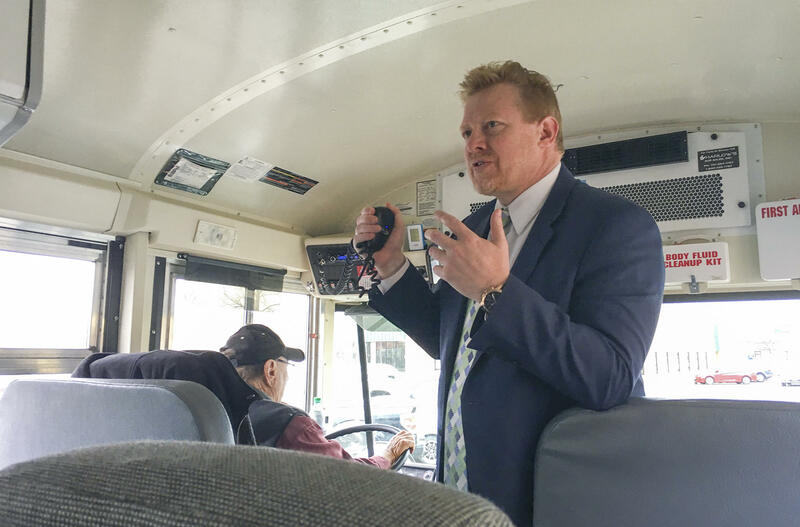 On a recent fall day, City Administrator Shawn Kessel led a group of state legislators on a bus tour of the city. “All of the buildings that you see on the right side were not here five years ago,” he says. There’s apartment complex after apartment complex, a new hospital, a new water tower and a new middle school -- all on a freshly paved road that skirts around the western edge of town, where much of the residential and commercial growth has occurred. That road doubles as a “bypass” for oilfield traffic so big trucks don’t have to drive through neighborhood streets. Dickinson Middle School Principal Marcus Lewton, left, shows legislators one of the shop classrooms in the new school. Elsewhere in town, there’s more: a new bridge over the train tracks, a new building with state-of-the-art gear for the city’s police and fire departments, and new facilities to process the town’s sewage. 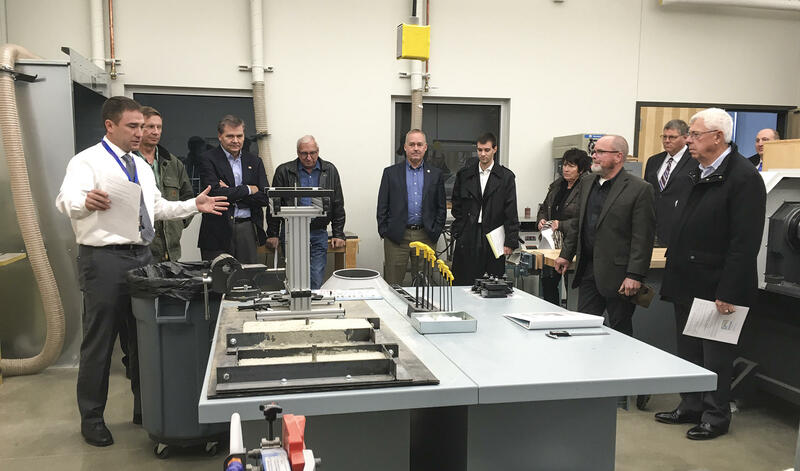 Legislators learned about the new $12-million lift station. Machines inside pump sewage underground in pipes to Dickinson’s new $30-million wastewater treatment facility. All this new infrastructure has put Dickinson nearly $100 million into debt. The city is paying back $5 million per year. Officials say they can afford those payments because of a critical stream of state funding the community receives due to its designation as a hub city. A hub city is a label given to three major oil patch communities in North Dakota: Dickinson, Williston and Minot. It all has to do with how tax money is distributed across the state. North Dakota taxes oil production. That money is doled out to hub cities, smaller towns, counties and school districts across the state. 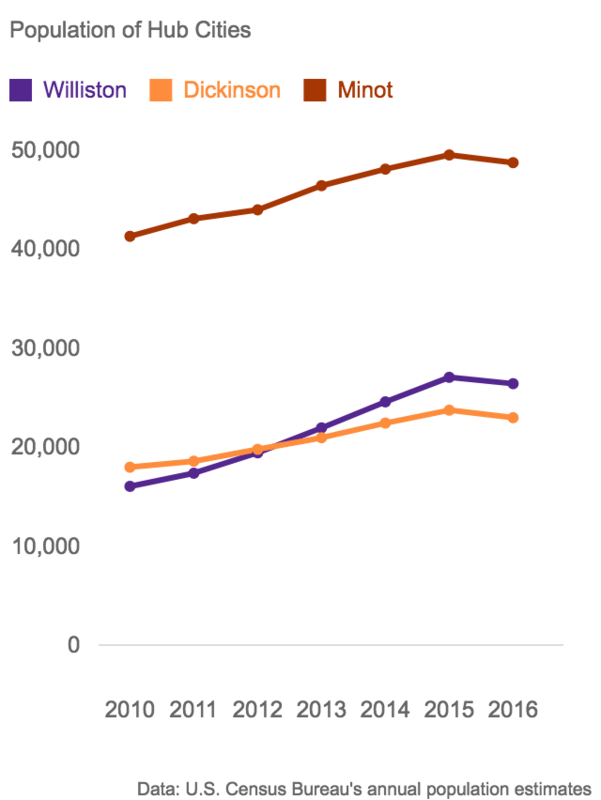 But starting in fiscal year 2014, the amount sent to oil patch communities changed pretty drastically. Lawmakers rewrote the funding formula guaranteeing oil patch municipalities and school districts more money to pay off their debt. Here’s a look at what the hub cities received over each of the past few years. The formula’s based in part on the number of oil workers in each community. Note that for fiscal years 2018 and 2019, the state treasurer’s office provided rough estimates for what the communities can expect in the years ahead. The state budget has tightened in the past few years because of the downturn in the oil industry. State coffers are no longer flush with cash the way they were during the boom years leading up to 2014. Then price of oil collapsed, and so did the tax revenue the state collects from oil activity. “There are some in the legislature that feel that now the activity has slowed down, there really isn’t a need for hub city funding,” Senate Majority Leader Rich Wardner says. That argument goes like this: Oil patch towns have received a lot of money to build up their infrastructure and public services thanks to the hub city tax formula. Now that oil’s no longer booming and hub city populations have dropped slightly, it's not the time for more state funding. Plus, state legislators this year had to cut funding for a variety of services across the state due to the budget shortfall (including cuts to Prairie Public Broadcasting). 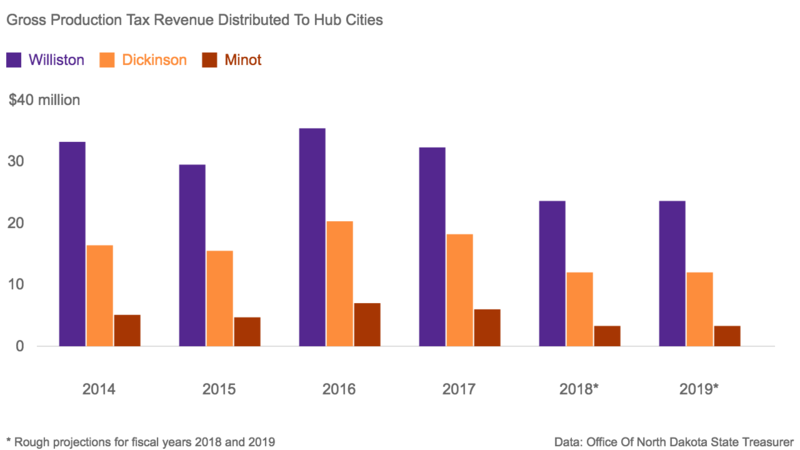 After all, the hub cities also collect local tax revenue through property and sales taxes, plus revenue from utility services like garbage collection and sewage. But city officials say they simply won’t be able to pay their bills without that state funding, and they see more infrastructure needs on the horizon. Convincing the Legislature to continue hub city funding is an endless task. The past few legislative sessions, the state has allocated money to hub cities just two years at a time. Dickinson’s leaders have to make the case over and over again for why the state should keep sending the extra money their way. It’s a tougher sell right now. So Wardner is working on a new formula to stabilize the production tax. It would guarantee cities like Dickinson those funds for at least a decade. This would help the town keep its head above water as it pays off its loans, while it keeps its streets clean and its parks family friendly. Dickinson officials want to avoid what happened after a previous oil rush during the 1980s. The city paid for expanded public services via “special assessments” -- essentially a tax on people who owned property in places where new development occurred, like the families that filled new neighborhoods. Then came the bust, and residents couldn’t afford the extra tax. Hundreds left town. Officials here say they do not want to go down that road again of raising local taxes too much. “We don’t want to drive people away,” Mayor Decker says. If local residents leave, the city would still face big bills and no easy way to pay them off.